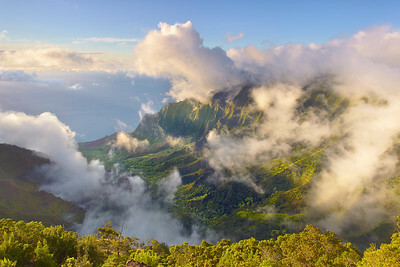 This north part of the island area receives anywhere between 100-150 inches of rain per year, but it is usually partly cloudy and still has lots of sunshine for landscape photography. 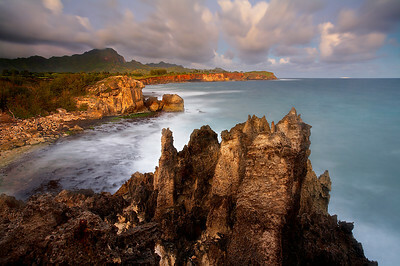 The eroded lava cliffs provide stunning vistas and backdrops for memorable images. Even though this area is only about 10 miles long, it would take many years to photograph it all. And even then, every view is different every day. The south side is dry and perfect for vacations. This island is usually included in top-10 island lists! Hanalei is a small town on the north shore of the island. It has a 3-mile wide perfect crescent of sandy shoreline with the rainiest mountains in the world right behind them. 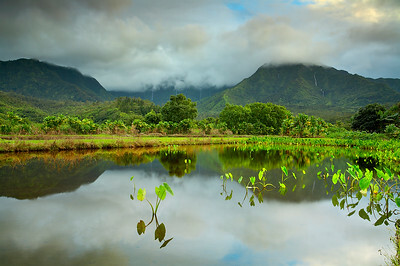 While it rains about 100 inches per year in Hanalei, it rains about 600 inches per year on Mt. Waialeale, about 5 miles behind the peak on the left. 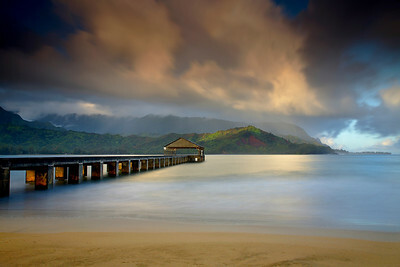 Even with all of the rain, days are usually sunny in Hanalei with maybe 1-2 hours of rain mostly at night. The mountains in this image range from 3,000 to 5,000 feet in height. 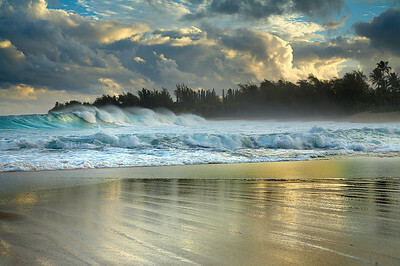 This shot can only be done with a medium tide and this effect only lasts for a few minutes before another wave moves in. Here, I attempted to show one of the waterfalls in the reflection. It took about 15 minutes of fiddling around before I finally got it right. All these elements combine to create a thickness to the atmosphere that makes me feel like I'm right back on the beach every time I view this image. I wanted to show how the large waves impact the lava shelf 20 ft. above the ocean and continue around and into this blowhole. The wave on the left is another 20 ft. above the shelf! This is not the sprouting horn on the south shore. To get this image at sunrise, I had to get up at 3am and slide down a very long muddy trail on my hands and knees in the dark, wash up in a nearby stream and run between lava shelves avoiding very large waves, while the light of dawn approached. I repeatedly had to grab the tripod and run to get away from each wave! 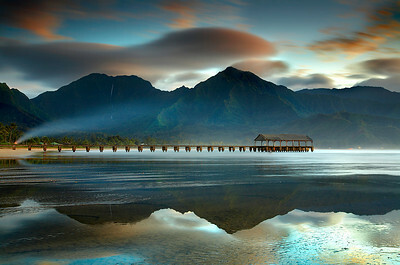 The Hanalei Pier points directly towards the mountains often referred to as "Bali Hai." It refers to a song written by Richard Rodgers and Oscar Hammerstein II from the musical South Pacific. This area resembles the island of Tioman, which is the original Bali Hai. 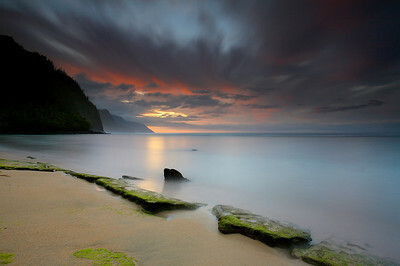 With the sun rising behind the camera, openings in the clouds allowed the light to filter into the clouds and illuminate the mountains on the opposite side of Hanalei Bay. Within 10 minutes the rain came in and this low warm light was gone for the day, replaced later by the bright light of mid-day. I used a long exposure to show the motion in the clouds. Also, the long exposure time smoothed out the water and simplified the image. That enhanced the effect of light hitting the posts of the pier. 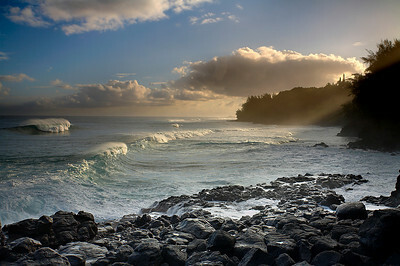 In the winter, large waves break in portions of Haena Beach that are not protected by the coral reef. This one is over 10 feet tall from its base. They can get even larger during winter storms. 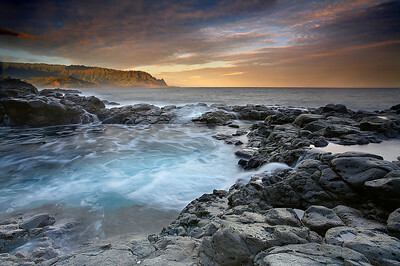 After every shot, I had to run, as I planted the tripod right in the path of the waves to get the best shot. These waves looked best just before the break, as the light penetrated through them. The sand glistened and moved for just a second before drying up, so timing was important. 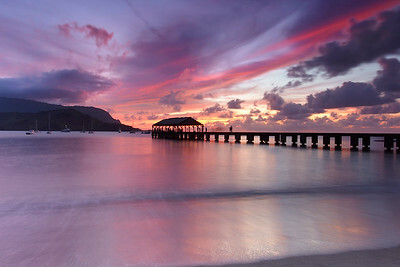 I wanted to create a surreal image that showed the interesting colors and detail under the Hanalei pier. A long exposure softened the waves which occasionally brushed up against the top part of the concrete in this image. I had to abort my 30 second planned exposure several times and run away from larger waves, until I had a good long period of smaller waves. 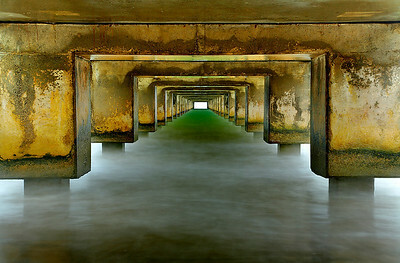 I like the symmetry underneath piers, so I always try to capture it if I can. 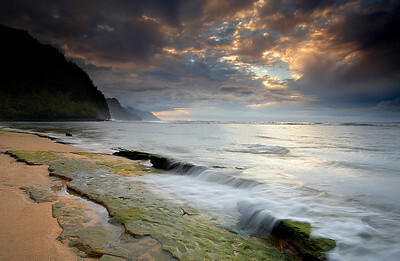 Kee Beach, on Kauai's North shore is a popular place to watch the sunset. But the people stay high up on the beach, allowing a good open view with no people in the image. This was a very enjoyable sunset to witness. Other than waiting for good light to come through the clouds and for just the right little wave to come through the offshore reef, this was an easy image to make. Well, people kept walking down the beach just as I was about to shoot...the nerve of them! This beach is as far as you can go before beginning the hike to the Kalalau Valley in the distance. This shows the very last light before it faded to darkness. 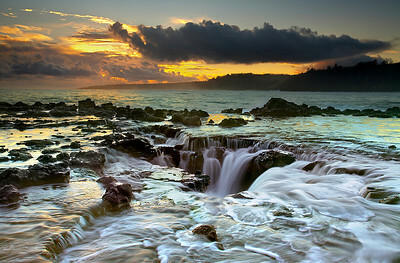 A long exposure allowed the sand and reef features to stand out from the moving water. For the viewer, this creates the feeling of standing right on this spot for the incredible sunset. There were several photographers with expensive cameras and tripods standing right next to me who insisted that there was no decent shot to be had on this evening. They looked incredulous as I stood there for the 90 second exposure, but they looked surprised when I showed them this picture on the back of my view screen! This goes to show that you should never give up until all the light is gone for the day. 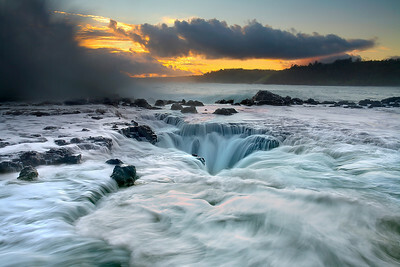 This naturally formed pool was scooped out of the lava by large and relentless surf. There is no coral reef offshore, so large waves from the North Pacific pound this area in the winter. On calm days at low tide, this pool is a great place to swim, but with high surf it is a great place to avoid, as it gets so violent that you can't even tell that there is a pool here at all! To make this photograph, I waited for the first rays of light to hit the distant mountains before taking this shot just after a wave had mixed up the water. My tripod was 50 feet above the water just to the left of the frame but I still got drenched right after I took this photo! These swells are quite large and I was waiting for a nicely formed one to appear illuminated by the rising sun. Fortunately I was able to get the shot and run before I was hit too hard! Even though this place is near Queen's Bath, it is pointing towards the island near the Kilauea Lighthouse. 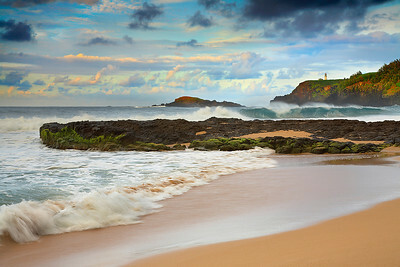 Originally, I came to this beach on the north shore of Kauai to make some images of the large waves there. While I was concentrating on the motion of the water, I noticed how the sand turned reflective for just a few seconds between waves. So I moved in closer to get a better view of the sand with the fast moving waves and well-lit sky in the background. I had to choose smaller well-formed waves, as the larger ones obscured the trees in the background. 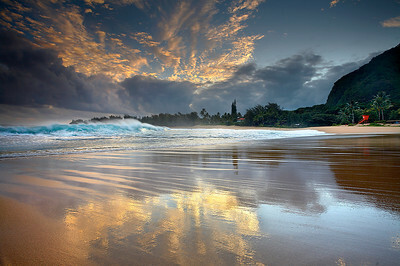 It took several attempts to capture a wave breaking while the sand was reflective and full of detail. Usually the sand dried up before the next wave hit, but my patience paid off. 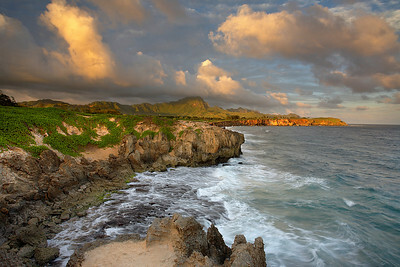 The coastline east of Poipu shows the remnants of ancient lithified sand dunes. It is a great hike after a day spend on a sandy beach. Watch out though, for these formations are very sharp. But the superb warm light at sunset is worth any pain! The mist and cloud set the mood on this memorable morning. Clear skies would have been nice to walk under, but the mood would have been gone and the light would have been harsh. 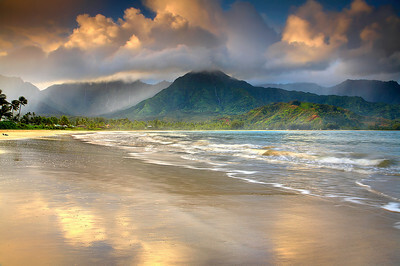 Hanalei Bay is a 3-mile long perfect crescent of sand surrounded by the world’s rainiest mountains. Over 500 inches of rain drench nearby Mt. Waialeale every year and about 100 inches fall on this beach. Despite all that rain, days are mostly clear so it still took me several return trips to this beach in order to be here at the right time. Up to seven waterfalls are often seen in the mountains after a good rain shower. The atmosphere created some nice warm filtered light, which turned the sand into gold for a few seconds in between waves. 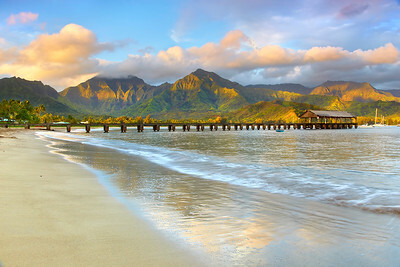 The Hanalei Pier is a great place to fish early in the morning, but I found nobody here for a few minutes just after sunrise. Within minutes, the fishermen appeared. I liked the light on the mountains in the background, which only occurs like this near the winter solstice. I waited for that log to wash ashore and add a little extra interest up front. Then I included a bit of the dry sand in the bottom of the frame to contrast with the wetter sand where the wave just washed ashore. I also made sure that the lens was high enough to see a glimpse of the waves above the top of the pier on the right side. Sometimes you have to think like a painter to improve the image. These lithified dunes near Poipu on the south shore, are relics of ancient beaches. The sand was literally cemented and then corroded by a geologically recent exposure ot the salty surf below. A small aperture was required to keep the foreground rock sharp. But that required a very long exposure. 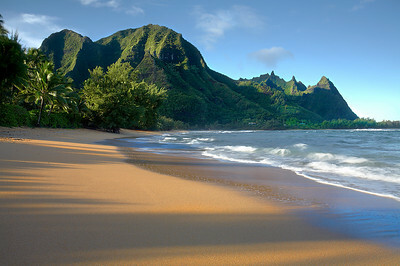 Haena Beach is a classic vision of paradise. Over 100 inches of rain fall here annually yet nearly every day is mostly sunny with just brief rain showers. These are perfect conditions for good light when the sun angle is low. I had to wait for over an hour at sunrise for clouds to the left of the frame to open up and let the light to hit the mountains and graze across the golden sand and clear water. Mid-day light would not show as much detail because there would be little shadow to accentuate the texture of the sand and cliffs. When I saw this scene, I was struck by how I could see the entire water cycle happening right before my eyes. The water was evaporating, lifting into the clouds, raining back to earth, flowing down the seven waterfalls, and draining into this taro field. There was no wind. Hundreds of small fish were swimming around, making the reflections soft while the leaves were stationary for the entire two seconds of the exposure. So they were perfectly sharp. To get to this spot at sunrise, a slippery path had to be navigated in the dark. I studied this particularly dangerous place for about 15 minutes to determine how the water moved. It turned out that while the water coming out of the blowhole was spectacular, the water motion going back into the hole was even more interesting. After finding a spot in the swirling water to brace the tripod, I was able to get several 'shoot and run' images. A 1/2 second exposure was enough to show the motion and still show detail in the water. I set up the filters and the camera settings before heading into the water. There was no time to do that once the action was unfolding. This beach just west of the Kilauea lighthouse is full of lava boulders and outcrops. Large waves pound the shoreline during the winter months. It is locally called secret beach, though many people have found it. It is an excellent beach with huge waves, lava outcroppings, and lots of shade and cliffs. A great place to spend the day if you don't mind the somewhat steep hike from a dirt parking lot! Moku`ae`ae island straight ahead can be seen in the background. 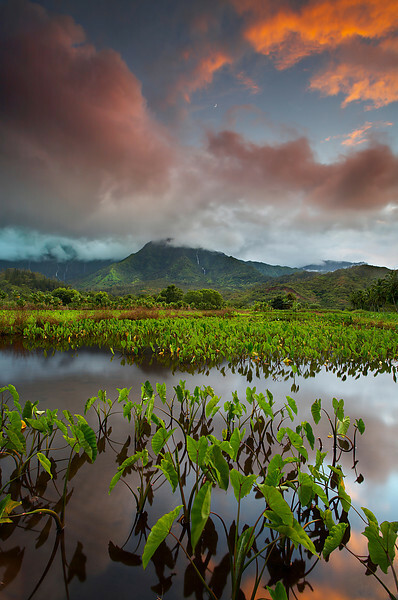 This taro field near Hanalei is planted and then flooded with water until the tubers are ready for harvest. I waited for a week for these conditions to appear. A big rain created 7 waterfalls (5 seen here and all seven in the image 'Water'), which only last a few hours. All I had to do here was wait for the breeze to calm down for 6 seconds and for the moon to pop out from behind the clouds. I needed F22 despite the long resulting exposure time because I wanted the leaves to be close in front and for them to be in sharp focus. First light during the summer is the best time to see the striking details on the rain sculpted 4,000 ft (1300+m) mountains behind Hanalei, Kauai. 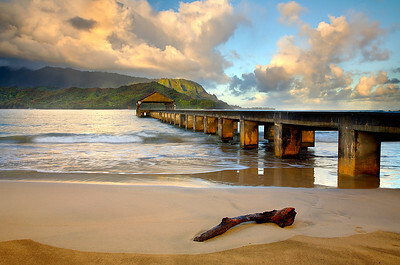 Each day in Hanalei seems to start out the same way. First a few fisherman walk out on the pier, then the paddleborders and surfers go out, then the runners appear on the beach, then the boats get ready for a new round of tourists to take the trip up the Na Pali coast for unforgettable views. 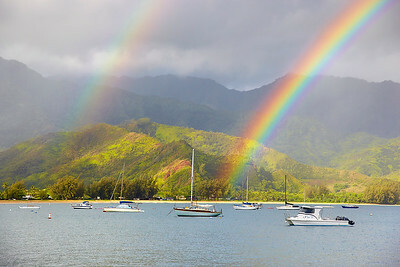 A double rainbow formed at sunrise as soft warm rain fell on Hanalei Bay. A warm heavy rain fell at sunrise, which often means that as the clouds lift a rainbow will form. 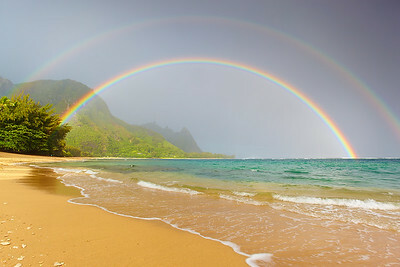 If the rain and sun are both strong enough, a double rainbow is formed! The is a well-known view, similar to the Yosemite valley view lookout spot. But one thing I've noticed is that most of the time, the photos are taken at midday and usually with little mist hanging around. You need a clear day to see this usually. Here, the mist had just cleared after raining for a few hours beforehand. The prospects were looking looking dismal, when all of the sudden, the heavens opened up and I saw this! It is quite shocking after being used to fighting the rain and seeing just a few feet in front of you for so many hours. It was SO worth the wait!